There are many causes of chest pain. A serious form of chest pain is angina, which is a symptom of heart disease and results from inadequate oxygen supply to the heart muscle. Angina can be caused by coronary artery disease or spasm of the coronary arteries. Chest pain can also be due to a heart attack (coronary occlusion), aortic aneurysm dissection, myocarditis, esophageal spasm, esophagitis, rib injury or disease, anxiety, and other important diseases. Do not try to ignore chest pain and "work (or play) through it." Chest pain is a warning to seek medical attention. People exposed in the 1940s, '50s, '60s, and '70s are now being diagnosed with mesothelioma because of the long latency period of asbestos disease. In choosing candidates for surgery, the individual's underlying physical condition matters. Diseases of other organ systems have a negative impact on survival. The more localized the disease (low stage) the better the prognosis. The cell type also affects prognosis; tumors with an epithelioid cell types have better outcomes. Endostatin works with angiostatin in destroying a tumors' ability to grow blood vessels without harming normal cells. Mujoomdar, A.A., and D.J. Sugarbaker. "Hyperthermic Chemoperfusion for the Treatment of Malignant Pleural Mesothelioma." Semin Thorac Cardiovasc Surg 20.4 Winter 2008: 298-304. Ried, Michael, et al. "Cytoreductive surgery and hyperthermic intrathoracic chemotherapy perfusion for malignant pleural tumours: perioperative management and clinical experience." Eur J Cardio-thoracic Surgery 43.4 April 2013: 801-807. What were the symptoms of mesothelioma in you or a relative? If you or a relative has/had mesothelioma, did you/they have a history of working with asbestos? Describe the tests and exams that led to a diagnosis of mesothelioma in you or a loved one. What kinds of medical treatment have you received for mesothelioma? Pleural effusion is a buildup of fluid in the chest or on the lungs. There are two types of pleural effusion, trandsudate and exudate. Causes of transudate pleural effusion include congestive heart failure, kidney failure, and cirrhosis. Exudate pleural effusion can be caused by malignancy (cancer) or lung infection. Typically, transudate pleural effusion is more easily treatable. Symptoms of pleural effusion include chest pain, pain when breathing, difficulty breathing, and cough. Treatment depends on the source or cause of the pleural effusion. Pleurisy, an inflammation of the lining around the lungs, is associated with sharp chest pain upon breathing in. 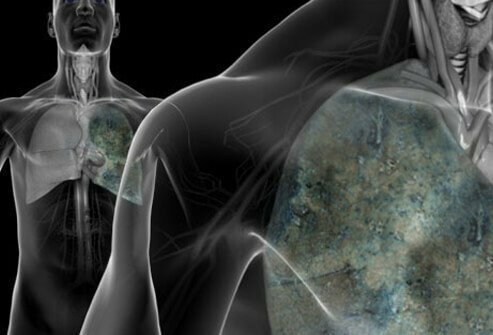 Cough, chest tenderness, and shortness of breath are other symptoms associated with pleurisy. Pleurisy pain can be managed with pain medication and by external splinting of the chest wall.